Ships to billing address only. 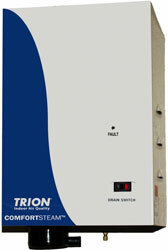 The Trion COMFORTSTEAM™ CFS20 at 115VAC can deliver 11.5 gallons per day of steam ouput. The self-Generating Electronic Steam Humidifier combine the purity of electrodebased steam humidification with the automation of electronic monitoring and control to provide a complete, easy-to-implement solution for your high capacity residential applications. 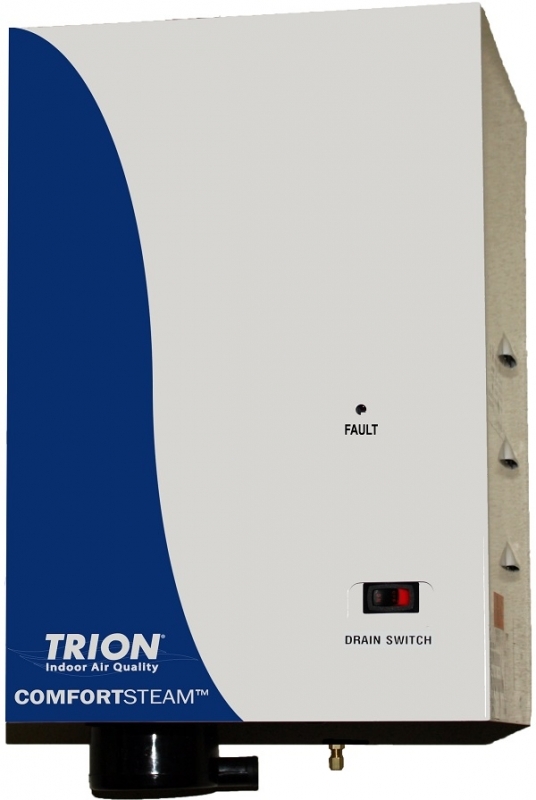 This same design was proven in commercial and industrial applications and now has been cost-reduced, offering the same professional level of performance to residential markets. Electrode steam humidifier operates by energizing two electrode extended into a canister of water. The current flowing between the electrodes and resistance of the water to the electric current heats the water. Minerals that are naturally found in water cause the water to be electrically conductive. Water conductivity is measured in micro Siemens per centimeter (uS/cm). Generally the higher mineral content the higher the conductivity. That being said water that is considered “hard”, potable or softened water have a higher conductivity and works well for the humidifier. Low hardness water or less conductive water will take longer to reach capacity. A tea spoon of bicarbonate of soda or salt can be added into the filling cup on start-up to speed up steam production. Demineralized or reversed osmosis water should not be used with electrode steam humidifier. As water boils into steam minerals are left behind. The remaining mineral will increase the conductivity of the water but also cause deposit onto the submerged portions of the electrodes, rendering those areas ineffective. As this occurs, the water level will rise to expose uncoated eletrode surface. The internal controller senses water level and measures the current flowing between the electrodes to determine when the canister needs replacement.